I recently acquired a huge lot of lunchbox tins, but in addition to those I also got some cool little humidor tins. These little guys are pretty neat and they have a dome lid that has a space to put a damp sponge. Once you were done with the tobacco that came with the tin you could use it as a humidor to keep your cigars fresh. These two tins are nearly identical in construction, but only 1 is marked by the maker. The similarities cause me to believe that they were both produced by S.A. Ilsley & Co. of Brooklyn, NY. The company was later bought by the American Can Co, and after the buyout used the label A.C.Co.8-A. The company was in operation under the Ilsley name from 1865 to 1920, so these tins fall within that period. The tin with the Ilsley mark is for Cameron & Cameron of Richmond, VA. The tin proclaims “Finest Grade of Smoking Tobacco”. 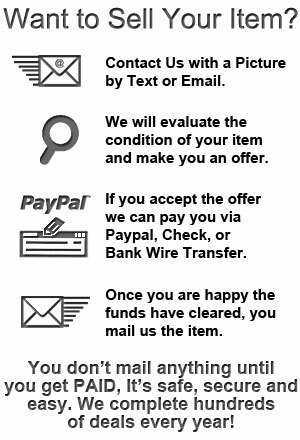 It’s clear however that this was a generic brand produced by Cameron & Cameron and then distributed and retailed regionally or locally because on the side it has a space for a paper label. 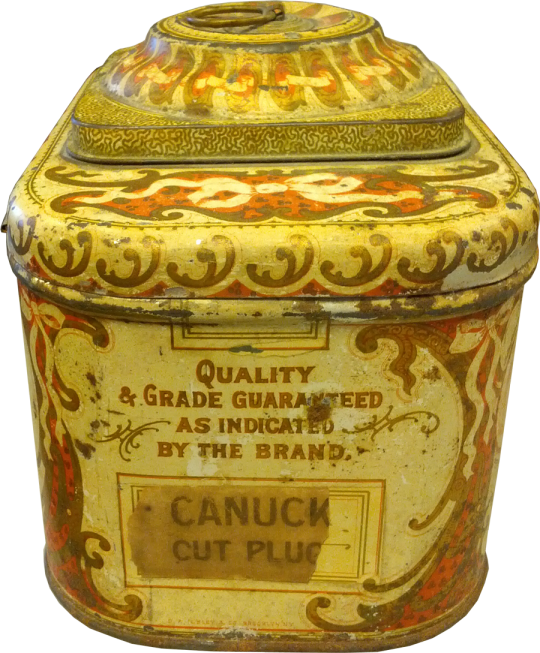 This side panel reads “Quality & Grade Guaranteed As Indicated By the Brand” below which is a blank spot for the paper label of a brand, in this case Canuck Cut Plug. 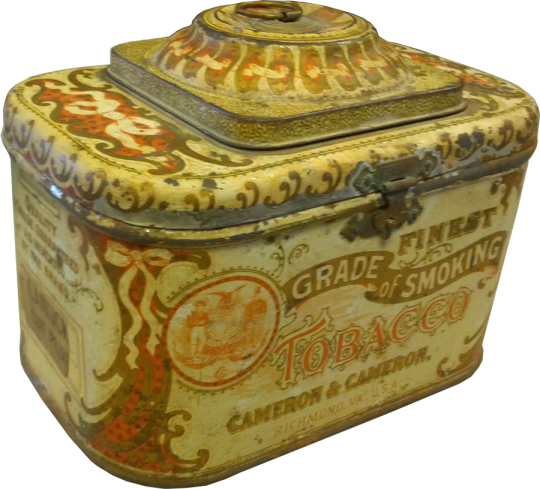 The tin features great ornamental decoration and I have seen this design for Cameron & Cameron in many color varieties. 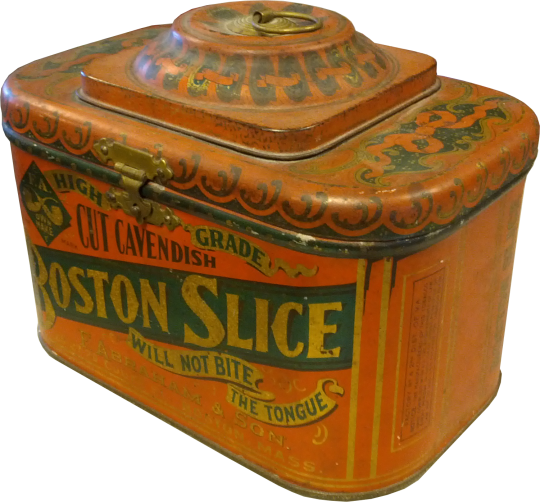 The other tin in this style that recently came in is for F. Abraham & Son “Boston Slice” brand. In addition to identical construction and design the tin features the exact same decorative graphics on the lid, although this tin is in red.